The Reducing Emissions from Deforestation and Forest Degradation (REDD+) mechanism was created in 2005 to conserve forest carbon stocks in addition to the myriad of other benefits forest dependent communities receive from forests. Under the mechanism countries receive payments for reducing emissions from deforestation and degradation below a pre-determined reference level. A priority is given to activities and projects that have positive impacts on forest dependent communities beyond the payments they receive for carbon. The REDD+ Academy was created to help countries transition from planning to implementation by inviting participants from a number of backgrounds and institutions to participate in a 10-day intensive course to learn about the REDD+ mechanism and apply that knowledge in their own countries. 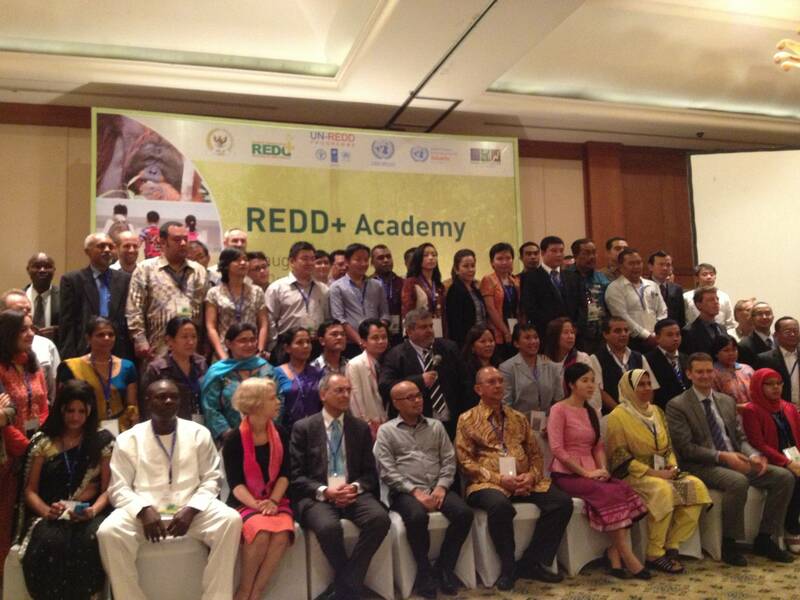 The first REDD+ Academy was recently held in Yogyakarta, Indonesia. Participants from more than 15 countries in the Asia-Pacific region came together to learn about forests and the links to climate change, develop best practices for REDD+ in their countries, and build a community of REDD+ champions that can learn from each other as they apply the knowledge they gained through the workshop. I had the privilege of being a facilitator during the workshop and presenting a session on how forest restoration could be used in REDD+ projects to provide benefits to communities and enhance forest carbon stocks. I worked alongside colleagues with backgrounds in forestry, community development, environmental economics, anthropology, and several other disciplines, to present material on different aspects of REDD+ and facilitate interactive sessions where participants could apply the lessons they’d learned. The entire workshop was designed to emphasize the importance of collaborating across disciplines, forest stakeholder groups, institutions, land uses, and cultures to conserve forest resources. We didn’t just talk about collaboration during the workshop. Participants worked together to apply the knowledge being presented and more importantly, they continued to work together after the formal learning was over to share their personal experiences of forest conservation from their own countries so that others could learn from them. The facilitators also learned a great deal from the participants personal experiences and my own feeling is that, in a cumulative sense, I probably learned more from the participants than they learned from me. After 5 days of classroom learning we went into the field to visit Semoyo village, a community that had restored several hundred hectares of deforested land with agroforestry and tree planting efforts. The community restored their degraded land once they were provided with sufficient tenure security. The community’s goal was to use restoration to reduce poverty through rural economic growth. The community uses local ecological knowledge to manage their mixed-age, mixed-species agroforests and forestland. Forestland is used to harvest timber for local construction material and to sequester carbon, which is later sold on the voluntary carbon market. Some timber is also used to produce furniture, which is sold in locally and in the capital of Jakarta. After 10 days the workshop closed and the participants and facilitators took the lessons we’d learned back to our respective homes and fields of practice. The full impact of the workshop will accumulate over years, if not decades, as we use our expanded network of practitioners to apply what we learned.